Children shouldn’t do jobs that make them sick. Yet in the United States, thousands of children work on tobacco farms, where they risk nicotine poisoning from their contact with the tobacco plants. Shockingly, this is perfectly legal – even for kids as young as 12. In 2013, Human Rights Watch conducted interviews with 140 child tobacco workers in North Carolina, Tennessee, Kentucky, and Virginia, the four states that produce 90 percent of US tobacco. We found that two-thirds of the children we interviewed reported vomiting, nausea, headaches, and dizziness while working on tobacco farms, all symptoms consistent with acute nicotine poisoning. Many worked 50 to 60 hours a week in extreme heat, and also reported exposure to toxic pesticides. Public attention to this issue, including from major media and even Comedy Central’s The Daily Show, prompted the two biggest US tobacco companies – Altria Group and Reynolds American – to adopt new policies beginning this year, prohibiting their growers from employing children under 16. These companies manufacture some of the best-selling cigarette brands in the world, including Camel, Marlboro, and Winston. 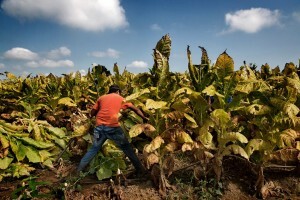 Two of the largest tobacco growers’ associations in the United States adopted similar policies opposing the employment of children under 16 in tobacco farming. Some multinational companies, including Philip Morris International and Japan Tobacco International, already had child labor policies in place that are more protective than US law. But these are voluntary policies, with no legal enforcement mechanism. Loopholes in US law still allow children as young as 12 (and on small farms, even younger) to work on tobacco and other US farms, with no limit on the number of hours they work, as long as it’s not when school is in session. These laws put children’s health and safety at risk every single day. Some members of Congress want the US to do better. Senator Richard Durbin of Illinois and Congressman David Cicilline of Rhode Island recognize the dangers of tobacco work for children and have introduced bills to prohibit children under 18 from working in direct contact with tobacco. If you agree, contact your representatives in Congress and urge them to support the “Children Don’t Belong in Tobacco Fields Act,” S.974/H.R. 1848. Jo Becker is the Children’s Rights Advocacy Director for Human Rights Watch. Follow her on twitter at @jobeckerhrw. Want to get involved? Learn more and take action to end child labor on U.S. tobacco fields at the First Focus Campaign for Children action center.